It’s so NICE not to have to worry about bending over and pinching myself. I don’t know if you’ve ever had staples, but removing them is really not supposed to hurt. The operative words being “not suppose to”. However, because I’m so awesome and heal rather quickly, my body started absorbing them so they were embedded enough to HURT when the tech plucked them out. Kevin actually sat there and watched and he could tell they were hurting me, and not just by my tortured, grim, I’m-going-to-be-brave-and-not-squeal-like-a-pig face either. He could tell by the amount of skin that was being tugged along with those nasty staples that I wasn’t exactly having the time of my life, don’t you know. I know you’re wincing and crossing your legs right about now; sorry about that. Riiiiight, my poo is just supposed to slip out. So I learned what NOT to do this morning. It was the first time I had really dared to try anything harder than a grunt and OUCH, I won’t be trying that again any time soon. BUT, at least I don’t feel like my guts are spilling out whenever I stand up anymore, so we’re making progress. Yay! Next I asked about scar tissue, as in, will I have a problem with it some time down the road. My doctor wasn’t very reassuring – he said “probably.” Ugh. But he said it likely won’t be for a very long time and if that happens, they sort of put a bag on me and wait for my intestines to settle down and it usually works itself out. It’s very rare that they have to actually cut into me and take care of it. I’m praying I never have an issue with scar tissue at all. I’m optimistic that way. Let me illustrate what the doctor said to me. 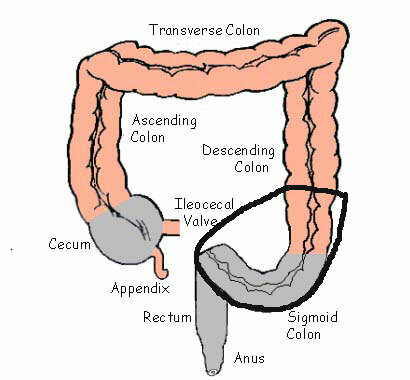 It was the Sigmoid part of my colon, which in essence means, “S” shaped. and the intestine above the twist was bloated and irritated. 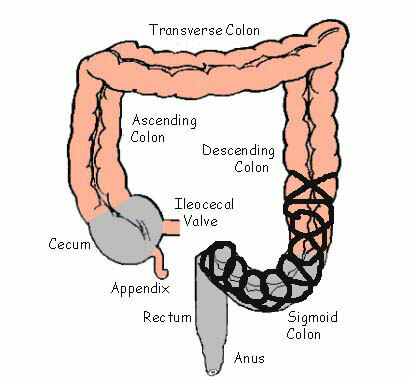 The intestine below the twist was also bloated and loose – “floppy” is how the doctor described it. So all of that floppy intestine after the twist needed to be removed. Guess how much intestine that turned out to be? Are you ready for this?? 96.2 CM. That works out to be just a smidgen over THREE FEET. It’s like I had a toddler-sized chunk of intestine rolled up inside of me. No WONDER I couldn’t pass anything!! WHAT?!?! No way! I hadn’t heard of anyone in my family having any issues like that (though I suspect my grandmother might have had something similar) and when I talked to my mom, she couldn’t think of anyone who had had intestinal issues like that so … what the heck?? I’m hoping it was just some fluke. 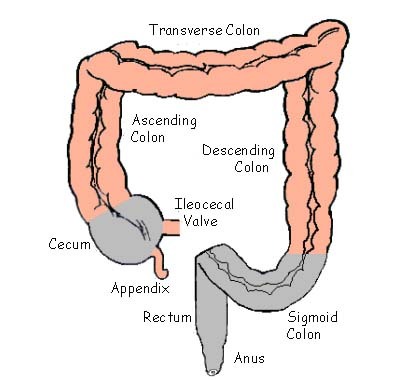 When I told the boys about it they groaned and said, “Great.” I’m sure they’ll be fine, but wow, I’m having a hard time wrapping my brain around the fact that he had to remove three feet of my intestine. He said I was like in his top two patients that he had to remove so much intestine from. He also said it was very unusual for someone my age (i.e. young) to have something like that happen to. He said he usually didn’t see cases like mine except in people in their 70’s and 80’s. I told him I should be in the medical books. I was serious. Aren’t you seriously impressed knowing that I had THREE FEET of intestine removed from my body? On second thought, don’t answer that. Anyhoo, I am under strict orders not to lift anything heavier than 10 pounds and absolutely NO EXERCISING for at least six weeks, though I can still walk. I’m okay. My insides are pretty sore today (I thought I was going to DIE when I had to use my abdominal muscles to lay back on the examining table and they haven’t quite recovered from that yet), and the area around my incision is numb, not to mention I won’t be showing off my belly any time soon thanks to a wicked looking scar (like I would have anyway), but hey, I can poop now so it’s all good.